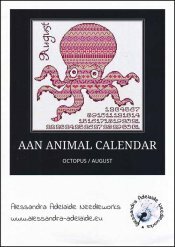 AAN Animal Calendar: August Octopus [H1702] - $13.44 : Yarn Tree, Your wholesale source for cross stitch supplies. Cross stitch pattern by Alessandra Adelaide Needleworks. August is approaching & this Octopus is ready for you to stitch him for your calendar! "August" is stitched on the left side of the Octopus with the numbers stitched below him. Don't let this Octopus swim away before you stitch him. Stitch count 150w x 150h.